In today's Hit and Run, Jay Jaffe looks at Marco Estrada's hard-luck run of back-to-back no-hitter bids, Chase Utley's ankle injury and Justin Turner's red-hot season. Max Scherzer flirting with no-hitters and chasing perfection is easy to understand: He's a great pitcher quite capable of having an especially great day or two. But it's a little harder to make sense of the recent run of Marco Estrada, a journeyman righty barely able to hold down a rotation spot. In both of his last two outings, the 31-year-old Blue Jays righty has chased no-hitters deep into his day, joining impressive company in the process. Where Paredes's hit ended Estrada's night after 118 pitches, manager John Gibbons let him keep going against the Rays; he completed the inning with six more pitches, pushing his total to 129—both a career high and the highest count in the majors since last July 23, when A.J. Burnett threw 131 over eight innings for the Phillies in a loss to the Giants. Cole Hamels was the only other pitcher to exceed that count last year, throwing 133 over seven innings in a loss to the Mets on May 11. Estrada's previous high was 115, set on Sept. 23, 2013 against the Braves. An eight-year veteran with a career ERA of 4.13 (96 ERA+), Estrada was acquired from the Brewers last November in a straight-up trade for Adam Lind. A former sixth-round pick by the Nationals back in 2005, he spent five years bouncing in and out of Milwaukee's rotation, and while his 150 2/3 innings in '14 were a career high, both his 4.36 ERA and 4.88 FIP were his worst marks in any season with a significant workload. His strikeout rate was an acceptable 7.6 per nine, but he was rocked for an NL-high 29 homers (1.7 per nine) and carried into this season a career mark of 1.4 per nine, a situation that did not bode well in the hitter-friendly AL East. Estrada spent all of April in the Blue Jays' bullpen before joining the rotation once Daniel Norris was farmed out. He did little to distinguish himself over his first eight starts, posting a 5.01 ERA, 4.44 FIP and 1.3 homers per nine over 46 2/3 innings, with only four of his outings extending beyond five innings. He's had more success in his last two outings thanks in part to more swings and misses with his changeup, generally his best pitch. Via Brooks Baseball, 17 of his swings and misses over his past two starts have been via the change, compared to 13 over his previous three starts. On Wednesday, he also had nine swings and misses via his fastball—which averaged 90.4 miles per hour and maxed out at 92—as many as he had over that same three-start stretch and more than he managed in any outing since Sept. 29, 2013. In carrying no-hitters at least seven innings in back-to-back starts, Estrada joined the company of the best pitcher in franchise history, Dave Stieb, who had back-to-back no-hitters broken up with two outs and two strikes, first on Sept. 24, 1988 against the Indians, then again six days later versus the Orioles. A seven-time All-Star who pitched for the team from 1979 to '92 with a brief comeback in '98, Stieb had several other close calls. He took a no-hitter into the ninth on Aug. 24, 1985 against the White Sox, only to have it broken up by back-to-back home runs, and he came within one out of a perfect game against the Yankees on Aug. 4, 1989, a season in which he also pitched two one-hit shutouts. Finally, on Sept. 2, 1990, he got his no-hitter—still the only one in franchise history—against the Indians. Via Elias Sports Bureau, the only other pitchers in the expansion era to take no-hitters at least seven innings in back-to-back starts are the Padres' Clay Kirby in 1971 and the Angels’ Nolan Ryan in '72 and again in '73. With those two starts, Estrada now has the lowest ERA (3.45) and FIP (3.83) of any Blue Jays starter this year. The team's rotation has been something of a trainwreck, offsetting what's become the majors’ most potent offense; the unit's 4.47 ERA ranks 13th in the league, and its 4.51 FIP is dead last. R.A. Dickey (4.88 ERA, 5.30 FIP) and Drew Hutchison (5.33 ERA, 3.93 FIP) have been dreadful, and Mark Buehrle (3.90 ERA, 4.30 FIP) has been mediocre. In his first season in the rotation, Aaron Sanchez (3.55 ERA, 5.18 FIP) got decent results through 11 starts despite walking 5.0 per nine, but he hasn't started since June 5 due to a lat strain and likely won't be back until after the All-Star break. The Jays are 39–35, two games out in the AL East and one back in the Wild Card, but if they're to reach the postseason via either route for the first time since 1993, they'll need much better work from their starters, whether it comes from outside the organization or within. 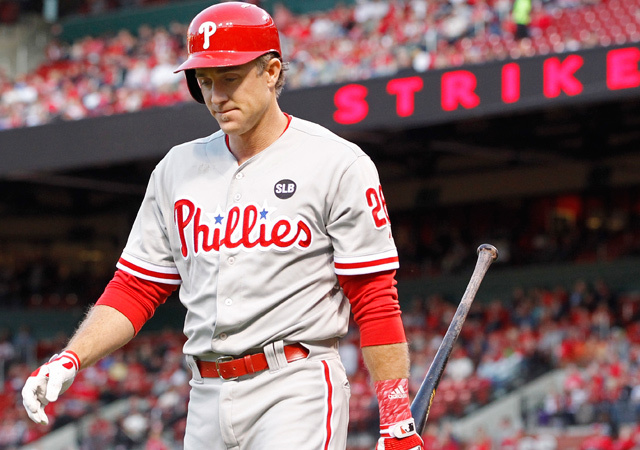 While the Phillies' slide into ignominy was easily foreseen given their belated approach to rebuilding, it's been sheer agony to watch Chase Utley fall apart. Coming off a solid return to health in 2014—.270/.339/.407 with 3.7 WAR in 155 games, his first season with more than 131 games since '09—the 36-year-old second baseman has been the worst regular in the majors this year, batting a wince-worthy .179/.257/.275 for a 48 OPS+, the lowest mark out of 163 hitters qualified for the batting title. Throughout his struggles, Utley told reporters he was healthy. But Tuesday night, he said the ankle has continued to bother him throughout the season. Head athletic trainer Scott Sheridan said Utley had an MRI in mid-May that showed inflammation on the bone and a ligament that was still healing. …Is the injury the reason for Utley’s struggles? Manager Ryne Sandberg was surprised by the news, saying that his star hadn't communicated any problem to him and that he didn't believe the issue affected him that much on the field. That seems unlikely given the aforementioned MRI, but it’s possible Sandberg is covering for his star. What does make sense is the likelihood that Utley wanted to set an example for his teammates by playing though what he perceived as a minor injury instead of ducking out on what's likely to be the team's first 100-loss season since 1961; at 26–48, the Philles' .351 winning percentage projects to a 57–105 record. What's more, Utley has a significant stake in gutting it out, because his $15 million option for 2016 vests if he reaches 500 plate appearances; he was on pace for 553. If his option doesn't vest, it converts into a club option valued between $5–11 million based on the number of days on the disabled list. Faced with the likelihood of a less lucrative contract, Utley may agree to waive his full no-trade clause if he does return to action and his bat recovers some life. In his absence, 25-year-old utilityman Cesar Hernandez (.242/.344/.333, 90 OPS+) will be the team's primary second baseman. When the Dodgers traded Juan Uribe to the Braves on May 27, it raised some eyebrows in part because it seemed as if the team was simply playing the hot hands of Justin Turner and Alex Guerrero, both of whom would likely cool off. But while Guerrero has come back to earth, losing time to newcomer Alberto Callaspo in the process, Turner has stayed red-hot: He's batting .353/.397/.647 in 73 PA this month with five homers, all of them in the team's last nine games. On Wednesday night, his three-run shot off the Cubs' Kyle Hendricks helped the Dodgers avoid a sweep at Wrigley Field. As Sarris’s FanGraphs colleague Dave Cameron pointed out on Wednesday, Turner has been the majors' second-most productive hitter over the previous 365 days behind only Paul Goldschmidt. His post age-28 breakout, while uncommon, has some recent precedents in players such as Jose Bautista, Casey Blake, Raul Ibanez, Melvin Mora and Marco Scutaro, all of whom were essentially replacement-level players into what should have been their primes before the light bulb finally turned on for one reason or another. Turner's emergence has given Dodgers manager Don Mattingly an enviable problem of trying to find enough at-bats for so many talented hitters. Sooner or later, that job might become even harder given that Cuban defector Hector Olivera, whom the team signed to a $62.5 million deal earlier this spring, has hit .358/.393/.528 in 13 minor league games since being cleared to play. But Olivera, who can play both third and second, suffered a Grade 1 hamstring strain earlier this week, which could knock him out of action until around the All-Star break.